The “Get Windows 10” icon appeared on my desktop some time ago and about a week after the official release date the upgrade downloaded itself onto the computer. I had played with the preview program on an old laptop so I was aware that there could be problems so rather than run the upgrade on my main PC I did a trial run on the laptop. The laptop originally had Windows 7 but then Linux and most recently the Windows 10 Insider Preview. I reloaded Windows 7 from the original recovery discs and used a downloaded ISO on a USB stick to upgrade to Windows 10. Getting the ISO for the USB was straightforward just go to Download Windows 10, select 32 or 64 bit and the media creation tool will make a bootable USB drive for you. The upgrade was surprisingly quick and everything worked first time, the drivers all appeared to work and the serial number from the old Windows 7 automatically activated the new install. I decided then to do a clean install on the laptop just to see how that would go. I formatted the drive and did a clean install from the USB stick. Everything installed first time without difficulty except for one Intel chip driver which went astray but it was soon found and downloaded. Windows upgrade ran almost at once and found a couple of updates and that was it. The laptop whilst old is still quite a good spec but I keep it mainly in case the newer desktop suffers a major outage. 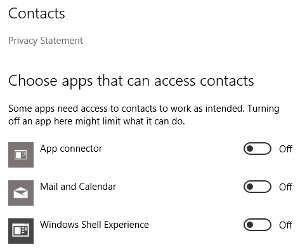 I spent some time exploring all the settings which are easy to find from the start menu and quickly discovered that Windows 10 wants to connect you to the world. Being a bit of a dinosaur I am not keen on “clouds” and “social media” and being permanently “connected”, so I spent some time switching the modern era off! Everything appeared in order and I quite like the look and feel of the new Windows so I played with the start menu and set about customizing that. My version of customizing was basically to remove all the apps and leave just a few useful live tiles like the weather and news but it is quite easy to add and remove programs. A program is dinosaur speak for an app. You really do want to check all those option switches though, otherwise you could be supplying the neighbourhood with downloads via any open WiFi networks about. To cut a long story short No WiFi, well I could see my router but Windows kept saying “Cannot Connect To This Network”. I can report that the Windows 10 trouble shooter is about as much use as a chocolate teapot, indeed as it was in previous incarnations. I reloaded drivers searched the web (using the laptop) for updated drivers but nothing wanted to work. Fortunately the Windows 10 installation had activated so I was semi confident that if I reset the PC it would remain as a legitimate install. A reset basically leaves all your files and programs intact and reinstalls Windows. I took a deep breath and pressed the button. The reset took much longer than the upgrade did. Windows came back replete with WiFi and then began the pain of reinstalling all the programs. The reset doesn′t delete programs from the computer but they are no longer installed. Anyway I had some of the more useful programs back in place when Windows Update tells me it wants to restart (you can′t turn it off but you can alter when it does restarts). Reboot and… no WiFi, the air is now turning a somewhat deep shade of blue. One more go, this time a clean install of Windows 10. Fortunately the computer has an SSD, which I added, for the operating system and all the programs, data and photos are on another drive. This makes it a little easier as the SSD can be repartitioned and formatted without losing anything useful. You can probably tell where this is going by now, a clean install of Windows 10 and everything is working, one update later and the WiFi disappears. I now have no idea how to get this going save a long ethernet cable up the stairs when the somewhat addled brain remembers that I have an unused USB WiFi adaptor in the workshop. Five minutes rummaging later I have a TP-Link TL-WN822N 300MBPS WiFi adaptor plugged in and working. There is an upside to this as the TP-Link adaptor is much faster than the built in Lenovo card and I can now get in the region of 90 Mbits/s over WiFi which aint half bad. Another hour resetting switches and installing programs and everything is working as it should be. So eventually with everything back to normal I have checked all my old software and am pleased to report that Geomagic Design works so that I can produce drawings. XAMPP works so that I can test bits of the website without the need to upload files. I have yet to reinstall Adobe Photoshop Elements or Premiere Elements as Adobe always loads a stack of unrequired sneaky software that wants to run all the time. I have been playing with the GIMP which is a free image processing program which seems to do most things I need albeit a little differently. I usually have a few browsers loaded for testing purposes and the new Microsoft Edge seems to work happily alongside the others although it hasn′t seen much use yet. Libre Office provides for all my office type needs and works as does Notepad++ which I use for editing the website. I have another PC in the workshop which is useful for checking drawings and looking up the odd bit of data when working on a project. Just to keep all the computers singing from the same songsheet I upgraded this as well. I used the same USB stick to upgrade rather than a clean install. The workshop PC is connected to the interweb but being some way from the house the WiFi signal has to crawl across the garden to get there, so the USB was much quicker than downloading about 3GB of data. This was an upgrade from Windows 7 and everything went smoothly. All my old settings were retained, all the old programs worked even the screen background and taskbar layout remained as they were in Windows 7. I must say I was quite impressed especially as the WiFi remained working and that′s how it should have been for my other desktop PC. Still I suppose with a million and one possible variations of hardware, software, drivers amd devices something is bound to go awry with such a massive worldwide software extravaganza, it’s just annoying that it was on my system. I still had to spend quite sometime though finding all those switches and disconnecting myself from modernity. All in all the upgrade was OK spoilt only by the WiFi driver problem, at least I assume it′s a driver I haven′t got to the bottom of that yet. I expect that at some stage a new driver will appear and the system will connect again but I am not really bothered as the new WiFi adaptor is much quicker. My first thoughts on Windows 10 are that it is an improvement over 8.1. 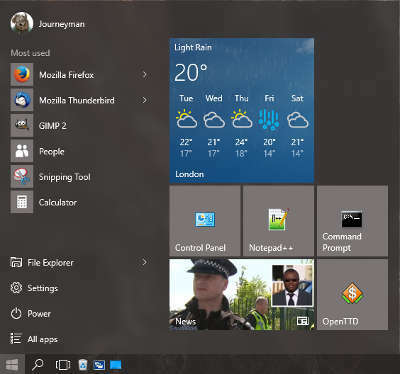 I like the style and the return of the start menu suits me much better than the Metro tiles of 8.1. Windows 10 seems stable thus far and my old software works without problem. My only real dislikes are the way it wants to connect and be online all the time and I would like an option to remove the lock and login screens which are a bit unnecessary as I am the only user. Just remember to go through all those option switches (yes, I know I am repeating myself). Have I turned Cortana on? I think not, I have enough trouble with a mouse and keyboard without the damn thing talking to me.